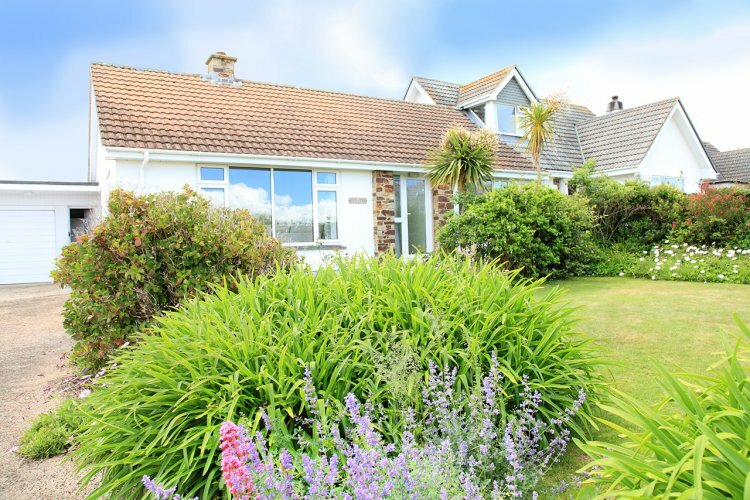 Deu-Try is a detached bungalow with good sized level gardens situated close to Mullion village and within easy walking distance of shops, restaurants and pubs. The footpath to Polurrian Cove with its sandy beach is close by, while Mullion Harbour and Poldhu Cove are within a mile of the bungalow. Mullion golf course is just over a mile away and the local riding stables are approximately half a mile. Entered via hallway with night storage heater, lounge/dining room with garden views having comfortable three-piece suite, electric fire, night storage heaters, digital TV/DVD player, CD stereo unit, dining table and chairs in the dining area. Fitted kitchen includes fridge/freezer, electric cooker, dishwasher, microwave, kitchen bar and stools. Serving hatch to dining room. Accessed from the kitchen at the rear of the garage is the utility room with sink, washing machine and tumble dryer. Double bedroom with built-in wardrobe and dressing table, bedside tables and lamps. Twin bedroom with built-in wardrobe and dressing table, bedside table and lamp. Both bedrooms have night storage heaters. Bathroom with electric shower over the bath and handbasin. Separate toilet. Enclosed private rear garden with garden furniture. Parking for two/three cars on the driveway. Rental includes electricity, heating, bedlinen and towels.